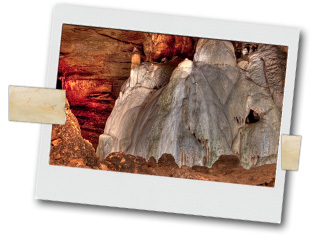 One of the reasons people like coming to Seneca Caverns is because of the rock formations that they see on the trip in the surrounding mountains and in the caves. Children and adults feel a sense of discovery as they find beautiful minerals and gems in amongst the dirt, mud and rocks. 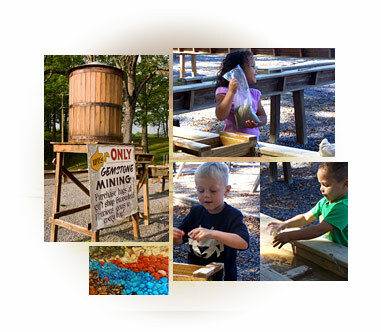 Gemstone mining gives visitors a chance to discover their own take-home treasures. Bags of mining rough are purchased in the gift shop and taken to the water sluice. The sluice channels a continuous stream of water through a trough that winds around a big, old double-trunk oak shade tree. Sifters are dipped into the water by the gemstone miners to sort the gems and minerals from the mining rough. Colors and textures emerge that surprise and delight the prospectors. Fool's gold is a favorite as well as rubies, rose quartz, garnets, amethyst and many other precious treasures. For the serious miners out there we now offer buckets. Get a bucket for $30, $50 or $70 and spend the day finding your fortune.